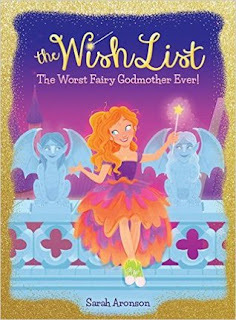 Q: What do you need to become a great fairy godmother? Fairy-godmother-in-training Isabelle doesn't know what gusto is, but she's pretty sure she has what it takes to pass fairy godmother training with flying colors. But then Isabelle is assigned a practice princess who is not a princess at all. Nora is just a normal girl -- a normal girl who doesn't believe in fairy godmothers, or wishes come true, or happily ever afters. Isabelle has to change Nora's mind about magic and grant a wish for her. If she can't, Isabelle will flunk training and never become a great fairy godmother! This was straight up adorable! All pink and sparkles! The main character, Isabelle, is not one for studying or reading the rules. But she learns really well through experience. Isabelle is a character that I think little girls will be able to relate to well. Even though her world is different from ours, she struggles with issues and temptations just like her readers. And would you believe that this little book ended on a cliffhanger?! It's true! I am seriously curious about what's going to happen in Book 2. I was never reading this book without a smile on my face. I will be giving this book to my little niece in hopes that she has as much fun reading it as I did! Labels: Sarah Aronson , scholastic , The Wish List #1 , The Worst Fairy Godmother Ever!